Newport Beach Therapist: Brenda Gesell - Therapist 92660. Send A Message To Dr. Gesell. 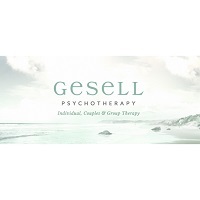 Gesell Psychotherapy is a group of exceptionally skilled clinicians on a mission to help people experience psychological freedom, gain greater intimacy in relationships, connect to soul and feel more alive. Our therapists believe in creating a sacred space where individuals can honor their true feelings and learn to let go of shame. Our treatment approach focuses on helping individuals develop mindfulness, curiosity and self-compassion. we are dedicated to supporting healing and growth. At Gesell Psychotherapy we have a warm, compassionate, down-to-earth style. Our therapists use a relational, depth-oriented treatment approach that focuses helping people improve self-awareness, learn self-acceptance and create greater intimacy in their relationships. It is common for patients to come in and report feeling "stuck". We work to help them find resolutions to their problems by better understanding themselves and communicating their needs to others. With just a little help they become "unstuck" and feel a great deal better. We also often work with individuals who experience an inner critical voice that attacks them with messages such as: “I am not enough” or "I am not enough, yet". Some explain feeling overly responsible and share that they have difficulty expressing their authentic feelings to others. Others judge themselves severely and feel strong feelings of self-loathing. Our patients discover that there is plenty of room for every aspect of their personhood. Shame, anxiety and self-loathing dissipate; self-acceptance is the natural byproduct of psychotherapeutic work. Self-compassion and acceptance lead to greater joy and fulfillment in interpersonal relationships. Many of our people begin psychotherapy with the belief that they need to reject elements of their personality, body or spirituality in order to gain love from others. Feelings of hopelessness, shame, guilt, anxiety, and of “not being enough” are common. We help our patients learn to accept and care for themselves wholly and freely.